The Source is blowing these out for $4.96! I normally don't buy Intec or Madcatz junk, but this is a great price. I bought 2; one from each store, 1 for me & 1 for my nephew's Wii. At one store, the employee actually knew it was on sale & had a sign up. But at the other, the guy had no clue until he was ringing it up... and while he was he kept saying something like, "Wow, what a price..." but the way he kept repeating it-- it sort of sounded like, "wish I'd *known* this was that cheap...."
Anyway, I've been playing No More Heroes 2 with the Intec Classic Retro Controller. 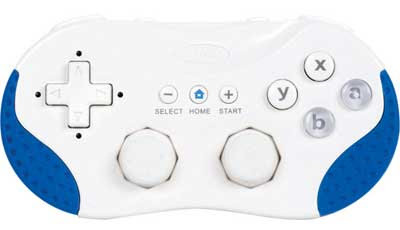 I wouldn't say it's better than the traditional Wiimote + Nunchuk combo, there are some advantages & disadvantages. My biggest problem with the Intec Retro Controller is that there are seams where the plastic meets the blue rubber, and it's at these seams that the plastic sticks out a bit, it isn't perfectly flush... so it feels sharp against the hands when your fingers curl around the controller. Indicative of cheap build quality, I may try to slice off/file down these rough edges. Resident Evil 4: Wii Edition - The Wiimote + Nunchuk is about the most perfect control setup for this game I can imagine. So why would I use a Classic Controller? Mercury Meltdown Revolution - The tilt control of the Wiimote is about the most perfect control setup for this game I can imagine. So why would I use a Classic Controller? Teenage Mutant Ninja Turtles Smash-Up - Also supports GameCube controller (I have a wireless WaveBird) so why would I use a Classic Controller? Mario Kart Wii - see TMNT answer. No More Heroes: Desperate Struggle - Admittedly there are things that can be done with the Classic Controller that can't be done with the Wiimote + Nunchuk: I didn't even know Travis could punch before using the Intec Retro Controller. Also, switching between swords is *much* easier because it's mapped to the D-pad. But there's a little more satisfaction doing gesture finishes with the Wiimote as opposed to just using the analog sticks on the Retro Controller. One funny thing I noticed when checking the controller icons on the back of my Wii games, Godzilla Unleashed doesn't have ANY controller shown! Man, that's freaky that they rushed through the production of this game & couldn't even remember to put the controller icon support on the back like every other Wii game does. And on a further tangent... when I check out my most played games on the Nintendo Channel, Godzilla Unleashed doesn't even show up even though I know I put a lot of hours into it. When I do a search through the channel it can't even find it. Scary. Thanks for the tip: I got one too! Nice... let me know if you experience the same sharp points on yours, and enjoy! You have a nice blog. At last you can unlock wii console worldwide without risky hardware modification or expensive modchip's. I remove all the guess work out of my 3 step process that will allow you to unlock your Wii in under 5 minutes!